So,what do these three ladies, one of whom was born three centuries ago, have in common? First, the reality: All three married prominent politicians who cheated on them. Huma, a beautiful elegant woman of accomplishment is all over the news this week for standing by her husband, just as Hillary and Eliza did. We always ask why, but in her case, we really wonder why. Huma works for the Clintons’ interests, and according to “reliable sources,” they are not happy with the situation, and who could blame them. Huma’s cushy job might be in jeopardy. Anthony Weiner, Huma’s husband has little to recommend him as a husband or politician. His prominence is limited to brashness and ego. With Bill Clinton, think welfare reform, a Balkan ceasefire. Hamilton created a central government that helped unify our new country–and that is only a sample of C and H’s accomplishments. So, why is Huma standing by her man? It’s a head scratcher. But, why did I include Mrs. Hamilton in the mix? For fun. The fun is in my new novel, in which Bill Clinton meets Alexander Hamilton. Possible titles: “Afterlife “or “The Ex-President and Wandering Ghost.” Since readers already know Monica Lewinsky, the book focuses on Mrs. Reynolds, Hamilton’s mistress who helped sabotage his brilliant career and Sarafina, his current lady friend, a freed slave. 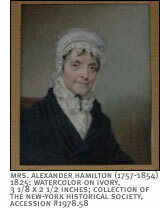 Mrs. Hamilton is a very forgiving woman.